Saint Leonard of Port Maurice was a most holy Franciscan friar who lived at the monastery of Saint Bonaventure in Rome. He was one of the greatest missioners in the history of the Church. He used to preach to thousands in the open square of every city and town where the churches could not hold his listeners. 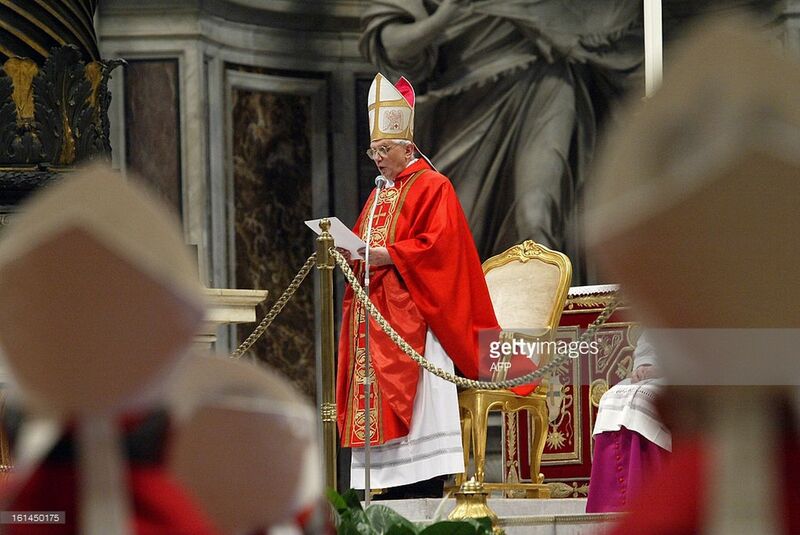 So brilliant and holy was his eloquence that once when he gave a two weeks’ mission in Rome, the Pope and College of Cardinals came to hear him. The Immaculate Conception of the Blessed Virgin, the adoration of the Blessed Sacrament and the veneration of the Sacred Heart of Jesus were his crusades. He was in no small way responsible for the definition of the Immaculate Conception made a little more than a hundred years after his death. He also gave us the Divine Praises, which are said at the end of Benediction. But Saint Leonard’s most famous work was his devotion to the Stations of the Cross. He died a most holy death in his seventy-fifth year, after twenty-four years of uninterrupted preaching. One of Saint Leonard of Port Maurice’s most famous sermons was “The Little Number of Those Who Are Saved.” It was the one he relied on for the conversion of great sinners. This sermon, like his other writings, was submitted to canonical examination during the process of canonization. In it he reviews the various states of life of Christians and concludes with the little number of those who are saved, in relation to the totality of men.The reader who meditates on this remarkable text will grasp the soundness of its argumentation, which has earned it the approbation of the Church. Here is the great missionary’s vibrant and moving sermon. Thanks be to God, the number of the Redeemer’s disciples is not so small that the wickedness of the Scribes and Pharisees is able to triumph over them. Although they strove to calumniate innocence and to deceive the crowd with their treacherous sophistries by discrediting the doctrine and character of Our Lord, finding spots even in the sun, many still recognized Him as the true Messiah, and, unafraid of either chastisements or threats, openly joined His cause. Did all those who followed Christ follow Him even unto glory? Oh, this is where I revere the profound mystery and silently adore the abysses of the divine decrees, rather than rashly deciding on such a great point! The subject I will be treating today is a very grave one; it has caused even the pillars of the Church to tremble, filled the greatest Saints with terror and populated the deserts with anchorites. The point of this instruction is to decide whether the number of Christians who are saved is greater or less than the number of Christians who are damned; it will, I hope, produce in you a salutary fear of the judgments of God.Brothers, because of the love I have for you, I wish I were able to reassure you with the prospect of eternal happiness by saying to each of you: You are certain to go to paradise; the greater number of Christians is saved, so you also will be saved. But how can I give you this sweet assurance if you revolt against God’s decrees as though you were your own worst enemies? I observe in God a sincere desire to save you, but I find in you a decided inclination to be damned. So what will I be doing today if I speak clearly? I will be displeasing to you. But if I do not speak, I will be displeasing to God.Therefore, I will divide this subject into two points. In the first one, to fill you with dread, I will let the theologians and Fathers of the Church decide on the matter and declare that the greater number of Christian adults are damned; and, in silent adoration of that terrible mystery, I will keep my own sentiments to myself. In the second point I will attempt to defend the goodness of God versus the godless, by proving to you that those who are damned are damned by their own malice, because they wanted to be damned. So then, here are two very important truths. If the first truth frightens you, do not hold it against me, as though I wanted to make the road of heaven narrower for you, for I want to be neutral in this matter; rather, hold it against the theologians and Fathers of the Church who will engrave this truth in your heart by the force of reason. If you are disillusioned by the second truth, give thanks to God over it, for He wants only one thing: that you give your hearts totally to Him. Finally, if you oblige me to tell you clearly what I think, I will do so for your consolation. Note well that there is no question here of the human race taken as a whole, nor of all Catholics taken without distinction, but only of Catholic adults, who have free choice and are thus capable of cooperating in the great matter of their salvation. First let us consult the theologians recognized as examining things most carefully and as not exaggerating in their teaching: let us listen to two learned cardinals, Cajetan and Bellarmine. They teach that the greater number of Christian adults are damned, and if I had the time to point out the reasons upon which they base themselves, you would be convinced of it yourselves. But I will limit myself here to quoting Suarez. After consulting all the theologians and making a diligent study of the matter, he wrote, “The most common sentiment which is held is that, among Christians, there are more damned souls than predestined souls.”Add the authority of the Greek and Latin Fathers to that of the theologians, and you will find that almost all of them say the same thing. This is the sentiment of Saint Theodore, Saint Basil, Saint Ephrem, and Saint John Chrysostom. What is more, according to Baronius it was a common opinion among the Greek Fathers that this truth was expressly revealed to Saint Simeon Stylites and that after this revelation, it was to secure his salvation that he decided to live standing on top of a pillar for forty years, exposed to the weather, a model of penance and holiness for everyone. The Bible also tells us that only two Hebrews out of two million entered the Promised Land after going out of Egypt, and that only four escaped the fire of Sodom and the other burning cities that perished with it. All of this means that the number of the damned who will be cast into fire like straw is far greater than that of the saved, whom the heavenly Father will one day gather into His barns like precious wheat. But oh, I see that by speaking in this manner of all in general, I am missing my point. So let us apply this truth to various states, and you will understand that you must either throw away reason, experience and the common sense of the faithful, or confess that the greater number of Catholics is damned. Is there any state in the world more favourable to innocence in which salvation seems easier and of which people have a higher idea than that of priests, the lieutenants of God? At first glance, who would not think that most of them are not only good but even perfect; yet I am horror-struck when I hear Saint Jerome declaring that although the world is full of priests, barely one in a hundred is living in a manner in conformity with state; when I hear a servant of God attesting that he has learned by revelation that the number of priests who fall into hell each day is so great that it seemed impossible to him that there be any left on earth; when I hear Saint Chrysostom exclaiming with tears in his eyes, “I do not believe that many priests are saved; I believe the contrary, that the number of those who are damned is greater. “Woe to you who command others! If so many are damned by your fault, what will happen to you? If few out of those who are first in the Church of God are saved, what will happen to you? Take all states, both sexes, every condition: husbands, wives, widows, young women, young men, soldiers, merchants, craftsmen, rich and poor, noble and plebian. What are we to say about all these people who are living so badly? The following narrative from Saint Vincent Ferrer will show you what you may think about it. He relates that an archdeacon in Lyons gave up his charge and retreated into a desert place to do penance, and that he died the same day and hour as Saint Bernard. After his death, he appeared to his bishop and said to him, “Know, Monsignor, that at the very hour I passed away, thirty-three thousand people also died. Out of this number, Bernard and myself went up to heaven without delay, three went to purgatory, and all the others fell into Hell. O abyss of the judgments of God! Out of thirty thousand, only five were saved! And out of sixty thousand, only three went to heaven! You sinners who are listening to me, in what category will you be numbered?… What do you say?… What do you think?…I see almost all of you lowering your heads, filled with astonishment and horror. But let us lay our stupor aside, and instead of flattering ourselves, let us try to draw some profit from our fear. Is it not true that there are two roads which lead to heaven: innocence and repentance? Now, if I show you that very few take either one of these two roads, as rational people you will conclude that very few are saved. And to mention proofs: in what age, employment or condition will you find that the number of the wicked is not a hundred times greater than that of the good, and about which one might say, “The good are so rare and the wicked are so great in number“? We could say of our times what Salvianus said of his: it is easier to find a countless multitude of sinners immersed in all sorts of iniquities than a few innocent men. How many servants are totally honest and faithful in their duties? How many merchants are fair and equitable in their commerce; how many craftsmen exact and truthful; how many salesmen disinterested and sincere? How many men of law do not forsake equity? How many soldiers do not tread upon innocence; how many masters do not unjustly withhold the salary of those who serve them, or do not seek to dominate their inferiors? All that we can find everywhere is selfishness, ambition, gluttony, and luxury. Is not the greater portion of men defiled by the vice of impurity, and is not Saint John right in saying, “The whole world – if something so foul may be called – “is seated in wickedness?” I am not the one who is telling you; reason obliges you to believe that out of those who are living so badly, very few are saved.But you will say: Can penance not profitably repair the loss of innocence? That is true, I admit. But I also know that penance is so difficult in practice, we have lost the habit so completely, and it is so badly abused by sinners, that this alone should suffice to convince you that very few are saved by that path. Oh, how steep, narrow, thorny, horrible to behold and hard to climb it is! Everywhere we look, we see traces of blood and things that recall sad memories. Many weaken at the very sight of it. Many retreat at the very start. Many fall from weariness in the middle, and many give up wretchedly at the end. And how few are they who persevere in it till death! Saint Ambrose says it is easier to find men who have kept their innocence than to find any who have done fitting penance. If you consider the sacrament of penance, there are so many distorted confessions, so many studied excuses, so many deceitful repentances, so many false promises, so many ineffective resolutions, so many invalid absolutions! Would you regard as valid the confession of someone who accuses himself of sins of impurity and still holds to the occasion of them? Or someone who accuses himself of obvious injustices with no intention of making any reparation whatsoever for them? Or someone who falls again into the same iniquities right after going to confession? Oh, horrible abuses of such a great sacrament! One confesses to avoid excommunication, another to make a reputation as a penitent. One rids himself of his sins to calm his remorse, another conceals them out of shame. One accuses them imperfectly out of malice, another discloses them out of habit. One does not have the true end of the sacrament in mind, another is lacking the necessary sorrow, and still another firm purpose. Poor confessors, what efforts you make to bring the greater number of penitents to these resolutions and acts, without which confession is a sacrilege, absolution a condemnation and penance an illusion?Where are they now, those who believe that the number of the saved among Christians is greater than that of the damned and who, to authorize their opinion, reason thus: the greater portion of Catholic adults die in their beds armed with the sacraments of the Church, therefore most adult Catholics are saved? Oh, what fine reasoning! You must say exactly the opposite. Most Catholic adults confess badly at death, therefore most of them are damned. I say “all the more certain,” because a dying person who has not confessed well when he was in good health will have an even harder time doing so when he is in bed with a heavy heart, an unsteady head, a muddled mind; when he is opposed in many ways by still-living objects, by still-fresh occasions, by adopted habits, and above all by devils who are seeking every means to cast him into hell. Now, if you add to all these false penitents all the other sinners who die unexpectedly in sin, due to the doctors’ ignorance or by their relatives’ fault, who die from poisoning or from being buried in earthquakes, or from a stroke, or from a fall, or on the battlefield, in a fight, caught in a trap, struck by lightning, burned or drowned, are you not obliged to conclude that most Christian adults are damned? That is the reasoning of Saint Chrysostom. This Saint says that most Christians are walking on the road to hell throughout their life. Why, then, are you so surprised that the greater number goes to hell? To come to a door, you must take the road that leads there. What have you to answer such a powerful reason?The answer, you will tell me, is that the mercy of God is great. Yes, for those who fear Him, says the Prophet; but great is His justice for the one who does not fear Him, and it condemns all obstinate sinners. So you will say to me: Well then, who is Paradise for, if not for Christians? It is for Christians, of course, but for those who do not dishonor their character and who live as Christians. Moreover, if to the number of Christian adults who die in the grace of God, you add the countless host of children who die after baptism and before reaching the age of reason, you will not be surprised that Saint John the Apostle, speaking of those who are saved, says, “I saw a great multitude which no man could number.“And this is what deceives those who pretend that the number of the saved among Catholics is greater than that of the damned… If to that number, you add the adults who have kept the robe of innocence, or who after having defiled it, have washed it in the tears of penance, it is certain that the greater number is saved; and that explains the words of Saint John, “I saw a great multitude,” and these other words of Our Lord, “Many will come from the east and from the west, and will feast with Abraham and Isaac and Jacob in the kingdom of heaven,” and the other figures usually cited in favor of that opinion. But if you are talking about Christian adults, experience, reason, authority, propriety and Scripture all agree in proving that the greater number is damned. Do not believe that because of this, paradise is empty; on the contrary, it is a very populous kingdom. And if the damned are “as numerous as the sand in the sea,” the saved are “as numerous at the stars of heaven,” that is, both the one and the other are countless, although in very different proportions. One day Saint John Chrysostom, preaching in the cathedral in Constantinople and considering these proportions, could not help but shudder in horror and ask, “Out of this great number of people, how many do you think will be saved?” And, not waiting for an answer, he added, “Among so many thousands of people, we would not find a hundred who are saved, and I even doubt for the one hundred.” What a dreadful thing! The great Saint believed that out of so many people, barely one hundred would be saved; and even then, he was not sure of that number. What will happen to you who are listening to me? Great God, I cannot think of it without shuddering! Brothers, the problem of salvation is a very difficult thing; for according to the maxims of the theologians, when an end demands great efforts, few only attain it.That is why Saint Thomas, the Angelic Doctor, after weighing all the reasons pro and con in his immense erudition, finally concludes that the greater number of Catholic adults are damned. He says, “Because eternal beatitude surpasses the natural state, especially since it has been deprived of original grace, it is the little number that are saved.”So then, remove the blindfold from your eyes that is blinding you with self-love, that is keeping you from believing such an obvious truth by giving you very false ideas concerning the justice of God, “Just Father, the world has not known Thee,” said Our Lord Jesus Christ. He does not say “Almighty Father, most good and merciful Father.” He says “just Father,” so we may understand that out of all the attributes of God, none is less known than His justice, because men refuse to believe what they are afraid to undergo. Therefore, remove the blindfold that is covering your eyes and say tearfully: Alas! The greater number of Catholics, the greater number of those who live here, perhaps even those who are in this assembly, will be damned! What subject could be more deserving of your tears?King Xerxes, standing on a hill looking at his army of one hundred thousand soldiers in battle array, and considering that out of all of them there would be not one man alive in a hundred years, was unable to hold back his tears. Have we not more reason to weep upon thinking that out of so many Catholics, the greater number will be damned? Should this thought not make our eyes pour forth rivers of tears, or at least produce in our heart the sentiment of compassion felt by an Augustinian Brother, Ven. Marcellus of St. Dominic? One day as he was meditating on the eternal pains, the Lord showed him how many souls were going to hell at that moment and had him see a very broad road on which twenty-two thousand reprobates were running toward the abyss, colliding into one another. The servant of God was stupefied at the sight and exclaimed, “Oh, what a number! What a number! And still more are coming. O Jesus! O Jesus! What madness!” Let me repeat with Jeremiah, “Who will give water to my head, and a fountain of tears to my eyes? And I will weep day and night for the slain of the daughter of my people.“Poor souls! How can you run so hastily toward hell? For mercy’s sake, stop and listen to me for a moment! Either you understand what it means to be saved and to be damned for all eternity, or you do not. If you understand and in spite of that, you do not decide to change your life today, make a good confession and trample upon the world, in a word, make your every effort to be counted among the littler number of those who are saved, I say that you do not have the faith. You are more excusable if you do not understand it, for then one must say that you are out of your mind. To be saved for all eternity, to be damned for all eternity, and to not make your every effort to avoid the one and make sure of the other, is something inconceivable. Perhaps you do not yet believe the terrible truths I have just taught you. But it is the most highly-considered theologians, the most illustrious Fathers who have spoken to you through me. So then, how can you resist reasons supported by so many examples and words of Scripture? If you still hesitate in spite of that, and if your mind is inclined to the opposite opinion, does that very consideration not suffice to make you tremble? Oh, it shows that you do not care very much for your salvation! In this important matter, a sensible man is struck more strongly by the slightest doubt of the risk he runs than by the evidence of total ruin in other affairs in which the soul is not involved. One of our brothers, Blessed Giles, was in the habit of saying that if only one man were going to be damned, he would do all he could to make sure he was not that man.So what must we do, we who know that the greater number is going to be damned, and not only out of all Catholics? What must we do? Take the resolution to belong to the little number of those who are saved. You say: If Christ wanted to damn me, then why did He create me? Silence, rash tongue! God did not create anyone to damn him; but whoever is damned, is damned because he wants to be. Therefore, I will now strive to defend the goodness of my God and acquit it of all blame: that will be the subject of the second point. Far more, because God sees that we could not even make use of His grace without His help, He gives us other aids; and if they sometimes remain ineffective, it is our fault; for with these same aids, one may abuse them and be damned with them, and another may do right and be saved; he might even be saved with less powerful aids. Yes, it can happen that we abuse a greater grace and are damned, whereas another cooperates with a lesser grace and is saved.Saint Augustine exclaims, “If, therefore, someone turns aside from justice, he is carried by his free will, led by his concupiscence, deceived by his own persuasion.” But for those who do not understand theology, here is what I have to say to them: God is so good that when He sees a sinner running to his ruin, He runs after him, calls him, entreats and accompanies him even to the gates of hell; what will He not do to convert him? He sends him good inspirations and holy thoughts, and if he does not profit from them, He becomes angry and indignant, He pursues him. Will He strike him? No. He beats at the air and forgives him. But the sinner is not converted yet. God sends him a mortal illness. It is certainly all over for him. No, brothers, God heals him; the sinner becomes obstinate in evil, and God in His mercy looks for another way; He gives him another year, and when that year is over, He grants him yet another. But if the sinner still wants to cast himself into hell in spite of all that, what does God do? Does He abandon him? No. He takes him by the hand; and while he has one foot in hell and the other outside, He still preaches to him, He implored him not to abuse His graces. Now I ask you, if that man is damned, is it not true that he is damned against the Will of God and because he wants to be damned? Brothers, you must know that the most ancient belief is the Law of God, and that we all bear it written in our hearts; that it can be learned without any teacher, and that it suffices to have the light of reason in order to know all the precepts of that Law. That is why even the barbarians hid when they committed sin, because they knew they were doing wrong; and they are damned for not having observed the natural law written in their heart: for had they observed it, God would have made a miracle rather than let them be damned; He would have sent them someone to teach them and would have given them other aids, of which they made themselves unworthy by not living in conformity with the inspirations of their own conscience, which never failed to warn them of the good they should do and the evil they should avoid. So it is their conscience that accused them at the Tribunal of God, and it tells them constantly in hell, “Thy damnation comes from thee.” They do not know what to answer and are obliged to confess that they are deserving of their fate. I will work out my salvation in fear and trembling!! and I ask dear Lord that You forgive us for we know not what we do…we know not how much we offend You! Agnus Dei, have mercy on us!!! My greatest fears grounded in Truth and articulated in a manner never heard anymore. “Work out your salvation in fear and trembling” is not written in God’s Scripture for no reason. The world is not a “safe space” and we all must recognize and face this fact. Lord have Mercy and grant me the Grace of True sorrow and repentance. Thank you so very much. I had lost track of this valuable teaching, preaching of this most excellent saint. May he remember our names at the time of our judgment.